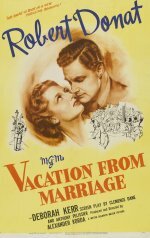 With the outbreak of the Second World War, a nondescript clerk (Robert Donat) and his dowdy wife (Deborah Kerr), locked in a staid and indifferent marriage, join the navy and the Wrens respectively. Their separate wartime experiences transform them and their post-war relationship. Adapted from a story by Clemence Dane, and produced and directed by Alexander Korda, this is an interesting, engaging and sympathetic film, guaranteed to please thanks to the presence of its attractive co-stars. The Americans loved it, and gave Miss Dane (who co-scripted with Anthony Pelissier) an Oscar for her story. Ann Todd, Glynis Johns and Roland Culver are excellent in the secondary roles. This is the uncut version with "Perfect Strangers" in the opening credits which has a few extra scenes not present in "Vacation from Marriage". The dvd is supplied with full custom artwork and shrink wrapped. The original runtime would be 102 minutes on an ntsc system (23.96 fps) but because playback is on a PAL (25 fps) system the runtime is just under 98 minutes.